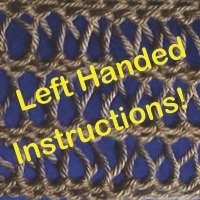 These instructions are easy to follow and within minutes you can have your own sock blockers for the fraction of the cost of a store bought pair. This is also a great gift idea for knitters who make lots of socks – it’s easy to make the a whole set with our free templates! Thick Foam Sheet (3mm foam is a little flimsy but will work; that’s what I used in the video below. If you can find the thicker foam, it will work better.) Remember to get enough if you plan to make a set! If you don’t want to use our templates. jump down to the next section titled How to Make Your Own Blocker Template. 1) Print out the template in the appropriate size; Adult pattern if you have an adult or teen sock, childrens if you have a kid’s, toddler’s or infant’s sock. 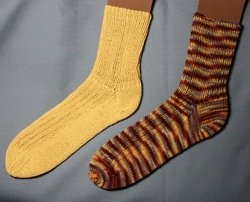 2) Hold your completed sock over the printed template to determine which outline matches the sock the best. 3) If the template is too short or long, don’t worry about that because you can extend it. For now, just try to match the general width, heel and toe shapes. 4) Cut the template out. 5) If you need to extend or shorten the length of pattern, cut along the line that says, “Lengthen or Shorten Pattern Here”. 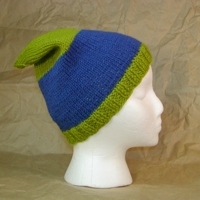 If needed, you can use our basic tips on how to lengthen or shorten a pattern. 6) Once you have your paper template sized properly, trace it onto the foam sheet. 7) Cut the foam sheet out. Place your sock onto a sheet of paper and spread it out as best you can. Trace around the sock, leaving a 1/4″ (about 6 mm) around the outer edge. Trace the sock template onto the foam sheet. Cut the foam sheet out. You’re done! Now you can wet your sock and block it. Fit it onto the sock blocker and lay the blocker flat or hang it up on a clothesline until the sock is dry. Check out our video demonstrating how to make sock blockers! Adult Socks – For Ladies – Simple and Quick!